Over the last couple of years, Costin Chioreanu’s aesthetic and outlook proved supremely compatible with Roadburn, thus they invited him back to put his inimitable signature on the 19th edition of the Roadburn Festival by designing the official artwork. 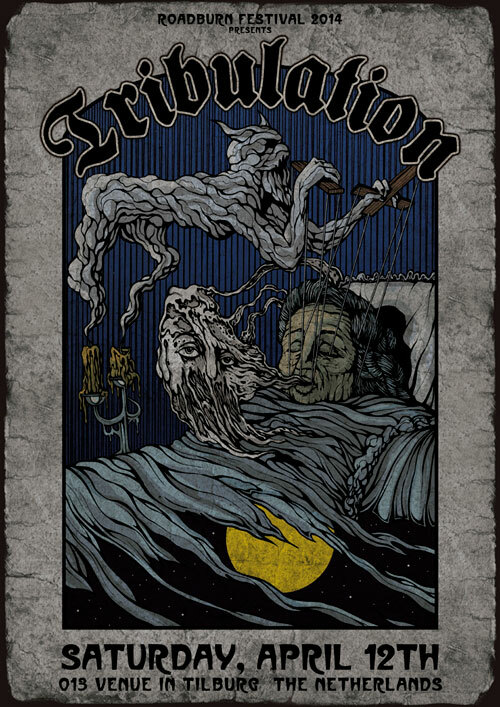 In keeping with tradition, Costin has also set the visual tone for some bands playing Roadburn Festival 2014 and they are proud to unveil his official poster for Tribulation. Feast your eyes and see what has sprung forth from the fertile imagination of this highly talented visionary artist. Today, he has emerged as one of the most talented artists in the realm of avant-metal and dark psychedelica, producing work for the likes of Darkthrone, Ulver, Triptykon, At The Gates, Neurosis and Opeth. Whether the images he conjures are disturbing, provocative or enchanting, they consistently show great finesse, sensitivity and depth.